A-PDF Flip Word allows you to batch create professional flash flip Books from Word or scanner with the "page turning" effect for both online and offline use in minutes. With A-PDF Flip Word , you don't need any additional software. Import your Word or scan from paper, configure book look&feel and convert. This is the best way to create digital (electronic) editions such as any type of publications, magazines, brochures and catalogues. You are not tied to the other's servers and per-pages costs. All flip book files are stored on your server and you do not depend on anybody. The system requirements to your site are minimal. You do not need PHP, ASP, mySQL or any other server applications to be installed. You do not need programming skills. The installation procedure is just a files copying on the server. The interface can be almost completely customized. A-PDF Flip Word can be easily integrated to any existing design and brand style. You can use a great variety of book interface settings. Change the flip book(s) title and colors or background image to match your needs. 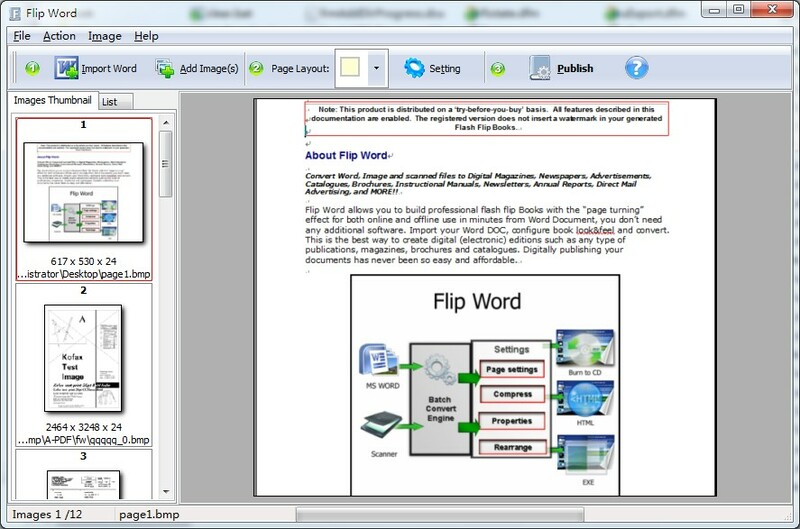 You can batch build professional flash flip Books from a group of images files at one time. Open a pdf file and save the content of the document as word file. Convert Word files into PDF files with one mouse click! Word to PDF is an easy-to-use and powerful PDF Converter. Is a Word Search game with elements of puzzle and strategy. Three entertaining and addicting word games included in one! A 'must-have' utility for the word-puzzle enthusiast. Qweas is providing links to A-PDF Flip Word 3.0 as a courtesy, and makes no representations regarding A-PDF Flip Word or any other applications or any information related thereto. Any questions, complaints or claims regarding this application A-PDF Flip Word 3.0 must be directed to the appropriate software vendor. You may click the publisher link of A-PDF Flip Word on the top of this page to get more details about the vendor.